NIH means the street never existed in Hegewisch with this name but the street did have this name elsewhere in the city. Avenue B, C, D & F were 1st, 2nd, 3rd a & 4th Ave. respectively. In 1902 they were located in the near the state line, east of the where the Trailer Park is today. 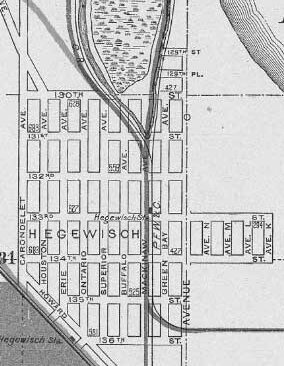 The streets ran north and south from approximately 132nd St. to 134th St. along the edge of Wolf Lake. The area was isolated from Hegewisch proper. Exchange Ave. (1914) - named for the business section located at 92nd st.
Torrence Ave. (1904) -Joseph T. Torrence, civil war general and blast furnace builder and developer. Waterside Ave. (1898) The avenue no longer exists. 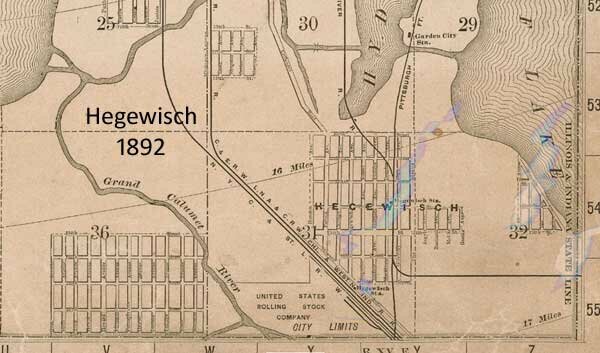 It was located along the shore of Wolf Lake from 132nd St. to 134th St.
Numbered Streets have also changed names but not in the Hegewisch Area. Possibly the wealthiest man in Hegewisch leads a parade past 13306 Ontario Ave.